January is a big month for soup in our household. It’s such a great food – wholesome, easy to do on a smaller budget (great after the December bacchanal! ), freezes beautifully and is such a treat in the chilly, dreich weather. I love salads when the sun is out but for a winter lunch soup is a firm go-to! This year I’m trying to make better use of in-season produce. There are some family favourites which we eat year round (onions, peppers, tomatoes, potatoes) and we are big fans of frozen veg for convenience, but at other times we are going to try to make use of produce that’s in season here in the UK. I think seasonality is a nice thing to embrace, even if it’s just a little. British cauliflowers are lovely just now, and as I wandered the supermarket aisles the other day it occured to me that I hadn’t cooked cauliflower in ages. Knowing that I had a lot of cheese in our fridge (never a bad thing, but there is a lot post Christmas), I thought combining the two would be a good idea. 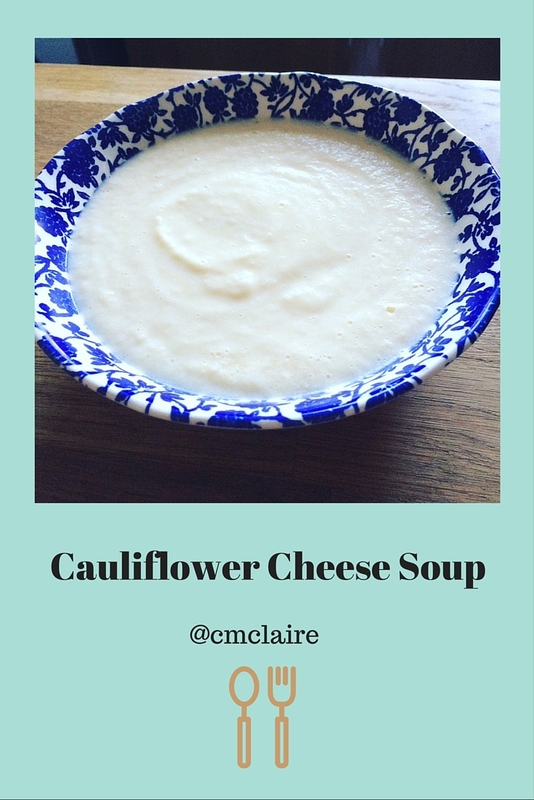 So I did, and came up with the recipe below – a filling, cheesey, and not horribly calorific winter soup. I hope you enjoy it – please let me know if you give this recipe a try! This recipe makes between 6 and 8 portions depending on hunger levels and whether or not you’re serving it as a starter, a light lunch, or a main meal. I’m having it for lunch most of this fortnight – it freezes beautifully so I have portions aplenty to enjoy. 1. Fill a large stockpot or pan with water, and put it on to boil. While it is doing so, wash your cauliflower, detach the leaves, and chop the vegetable up into pieces. 2. Once the water is boiling, add the cauliflower and boil for around 10 minutes (roughly until the vegetable is soft enough for a fork to pass into it with ease). 3. Place a colander over a large bowl – you are going to reserve some of the water the vegetable has been boiling in to add to your soup. I find warm water is always easier to add than cold, and the water you’ve used to cook holds some of the flavour of the veg and negates the need for stock – a good thing given how salty the cheese will make the soup already. I ended up using about 6 ladles full of this reserved water when combining my soup. 4. Drain your cauliflower, and set your cauliflower and reserved cooking water aside. 5. Return your large pan to the hob. Add butter, then milk, then creme fraiche. Here I used what I had in the house, I’m sure swaps various would work with the dairy components. 6. Next, alternate adding cauliflower, cheese, and reserved water to the pan until all your ingredients are combined. I used a combination of Red Leicester and Double Gloucester cheeses as that’s what we had a surfeit of in the fridge. I think a good strong mature Cheddar would be amazing. 7. At this point your mixture will look a little odd….because it’s blending time! I used our Vitamix to blend our soup to smoothness in batches, but I’m sure a stick blender would work just as well. 8. Bring the whole mixture up to piping hot, add your black pepper to taste, and serve. A yummy way to enjoy a hit of vegetable goodness. Mmmmm this sounds like winter perfection…! So yummy! I am high fiving my past self for being switched on enough to make several batches – it's getting me through this chilly month in style.